It's 11pm Saturday night and I am on the computer!!!! Most unusual, I am generally out dancing somewhere but tonight there just wasn't anything that I thought I wanted to go to so Ray, Sharyn and I went and saw "Larry Crowne" at the Piccadilly Theatre. It was very short, about an hour and a half but we all enjoyed it. Had a good laugh a couple of times. I am a bit tired of trying to post my previous layout on Kaisercraft. 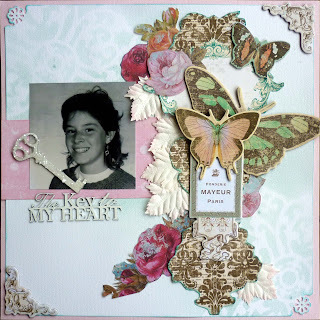 I have been trying since Thursday to link the post in the comments for July #3 Saturday sketch and it just will not appear on the blog. I have emailed them with my problem and have not heard from them. 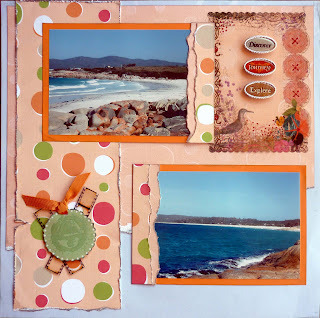 Went to a class with Heather Jacob today and did a fantastic layout. I just love Heather's work and am very happy with the layout I did today. I will post it tomorrow after I have taken a photo of it. We are off to the Legends Rock n Roll Club members BBQ tomorrow. The band is The Kreole Band and they play a lot of Elvis songs. Should be interesting. 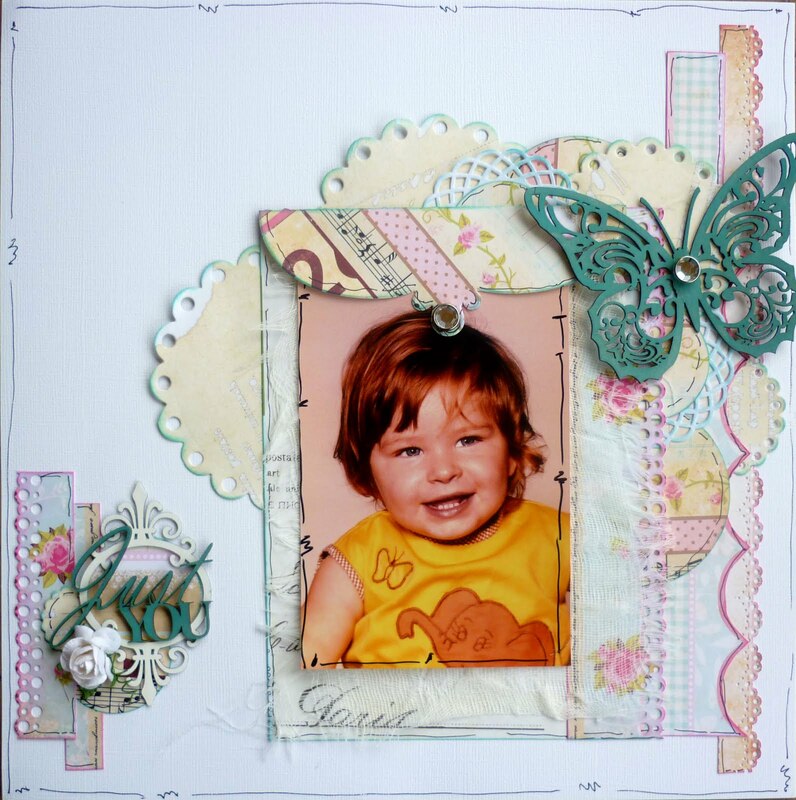 I have just finished this layout for the Kaisercraft Saturday Sketch Challenge. I have used sketch No. 3 for July. 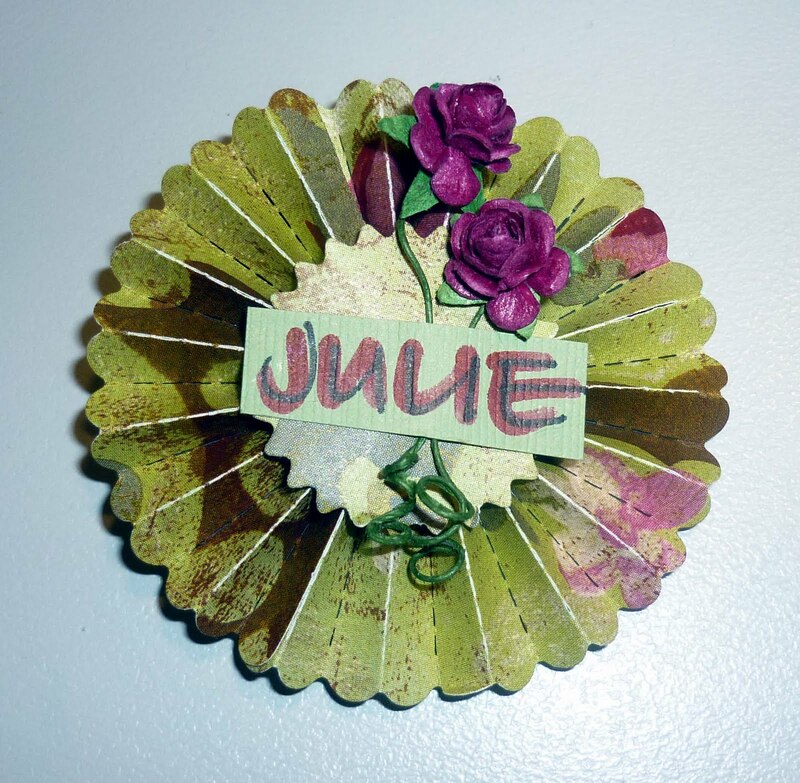 I have used Kaisercraft Lush Collection of papers and Kaisercraft wooden flowers. 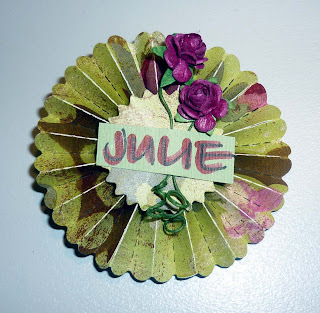 All of the chipboard and wooden flowers were painted with acrylic paints. Sorry, I put the wrong photo in the Mr Linky on the Stuck Sketches?! site!!!!!!!! Tried to delete the link and re-do it but can't work out how to. If anyone can tell me how I would love to know. I am loving pale colours on a white background at the moment so that is what I have gone with for this sketch. The background white card was embossed with family saying when I bought it. I have lightly rubbed a pink ink pad over it to highlight the text and then sprayed with iridescent Gold Glimmermist. As you can see by the photo the background card is a bit warped from the spray!! I have followed the sketch pretty closely. The White scalloped boarder and the name are chipboard that I painted with White acrylic paint and then a coat of white pearl paint to give it a bit of shimmer. The photo is of my daughter when she was about 2. Whoops, forgot to show you the cute name badges we made for the All Day Scrap. I really like these flowers so I bought the Tim Holts die to make them. Unfortunately now I have to buy the extended plates to put them through the Big Shot. Aaahhh well what else have I got to spend my money on!!!! Yesterday I attended the Seriously Scrapbooking All Day Scrap. What a great day. The projects were beautiful and the food delicious and plentiful. The first project was a card with Natalie and I have not finished mine yet as there is a lot of fussy cutting involved and that is something I will do over the next week or so. I will post a picture here when it is finished. 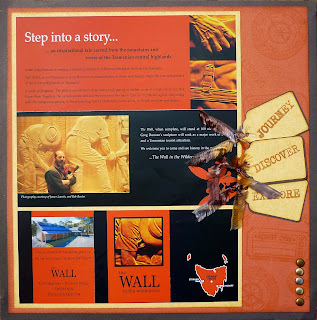 The second project was a layout by Steph. We used masks with Glimmermist which is something I have been meaning to try for sometime. It is so simple. 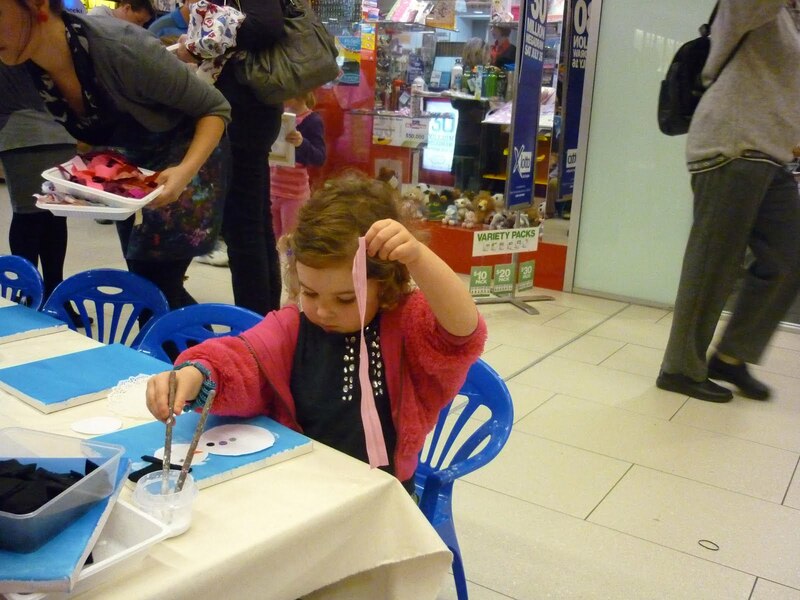 We also used some "fluffy" glitter on the key which was something I had not used before either. Once again it was very simple but both techniques are very effective. Here is my layout. Cindy is about 12 or 13 in this photo. The next project was by Heather. 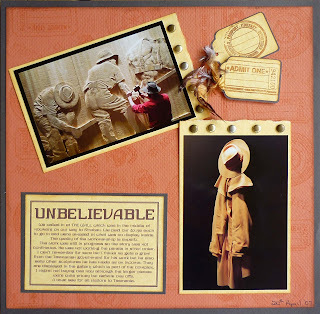 I love Heather's work and this page is no exception. Cindy is about 18 months old in this photo. 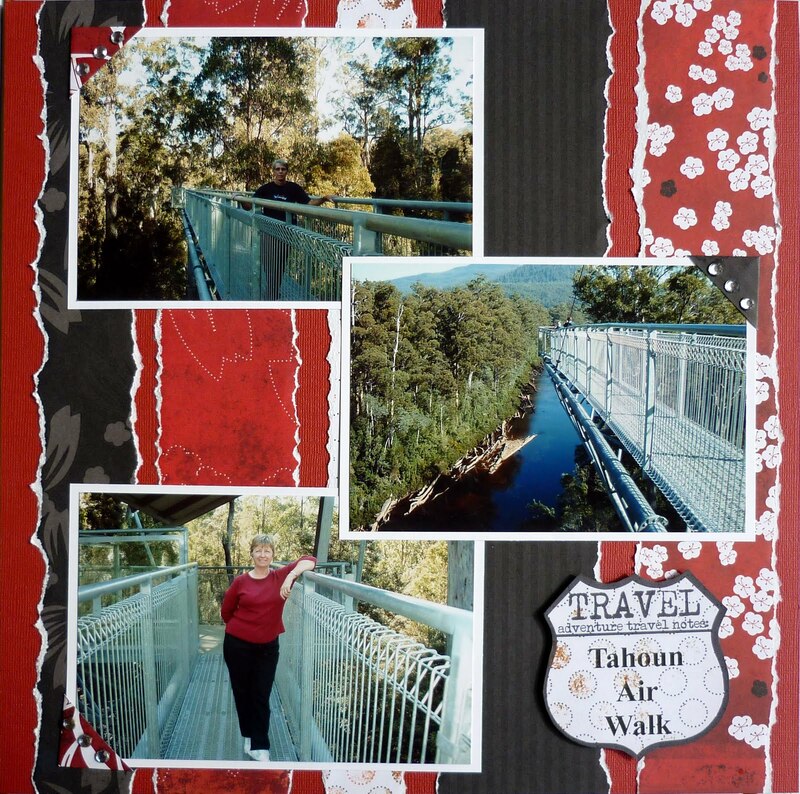 Unfortunately I had to leave early and did not get to do Jane's altered art project using a tin but I have the kit and the instructions so I can complete this at my leisure and Jane has offered help with anything that I may not be too sure about. I had received a phone call from my sister Anne during the morning letting me know that she was in town, she lives in Port Lincoln, and could we catch up. Ray & I had dinner with her at the Highway and then the 3 of us went dancing at the Windsor. The band was Jump n Jive and they were at their best. We had a great night. It was terrific to catch up with Anne. Thought we might go and see the Party Cats this afternoon but as the day wears on I feel less inclined to go anywhere. Anyway thanks for looking at my blog. Here is my layout for the Black with 2 Challenge. 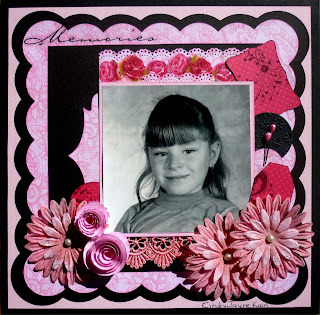 The challenge is to use a black background with pink and pearls. 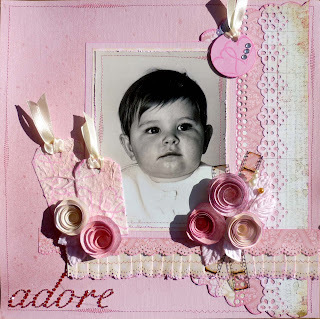 I have used an assortment of pinks and the pearls are the centres of the 3 pink flat flowers and the pins. Cindy is about 2 or 3 in this photo. Unfortunately back in those days I did not date photos and she is 37 now so it is a bit of a stretch to remember how old she was exactly. A whole week has pasted since my last post....life gets in the way sometimes. I have been very busy, we have had a great weekend. Friday night we went to Legends and the band was Ange & the Boyz. They were good and we caught up with lots of friends. Saturday I looked after Charli while Cindy had her hair done and then Saturday night we went to the Adelaide Rock n Roll Club Ball at the Adelaide Town Hall. This photo was taken at Wendy & Lindsay's house while we were having a drink waiting for the limo to pick us all up. The bands at the Ball were Mack Brown 7 and Twenty Flight Rock. The acoustics are terrible and the music was not the best but we had a few dances and made the most of it. This is the first time I had been inside the Town Hall and it was very impressive. 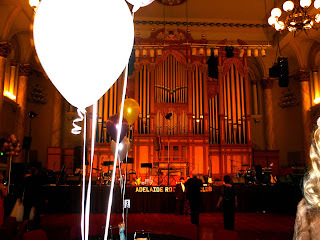 This photo is of the room where the Ball was held. 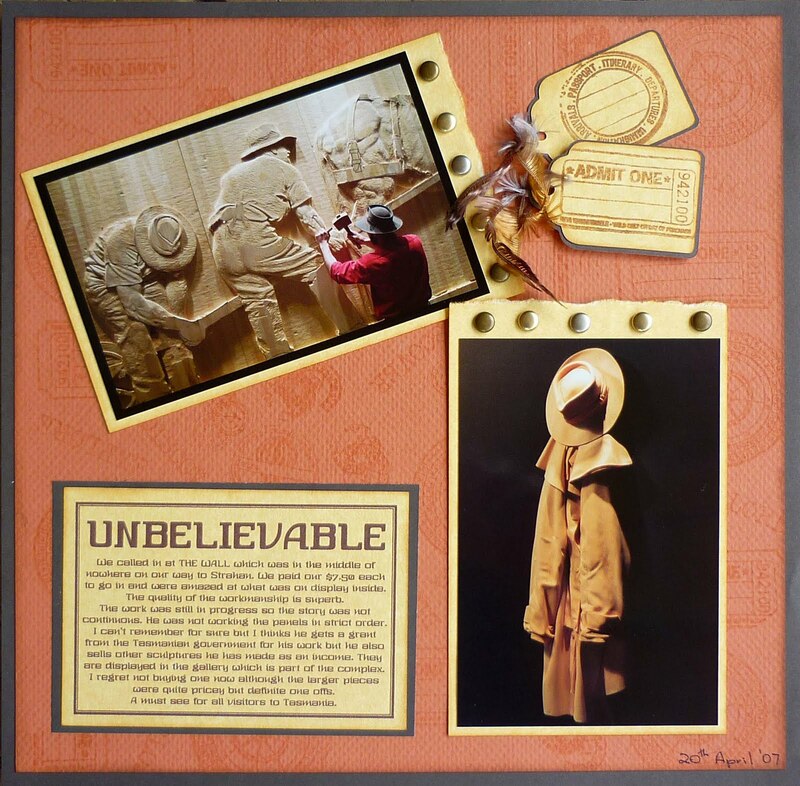 It is hard to get a photo in these lighting conditions but you can see some of the detail. 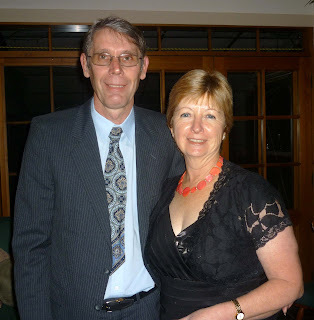 After the ball we all went back to Wendy & Lindsay's for drinks and supper. Wendy, as usual, supplied a great supper. She is definitely the hostess with the mostest. Sunday being Ray's first Sunday that he was not working was well spent. Firstly we went to the Adelaide Sea Rescue Club and saw the band The Black Hats. They are a country band but they played quite a bit of country rock. We had a few dances there before moving on to the Port Dock Brewery Hotel in Port Adelaide where the band was Four Crying Out Loud. They were very good and the venue was great. The floor was great to dance on and the service excellent. They finished playing a 6pm so we went around the corner to the Lighthouse Hotel and saw Sons of Sun. They are a rockabilly band but we did manage to get a couple of dances in before we came home about 7:30. I have managed to complete a layout during the past week. It started out as part of the Bird is the Word challenge but I missed the deadline so I didn't use the word Hope I used Adore instead. This photo is of Cindy when she was about 6 months old. 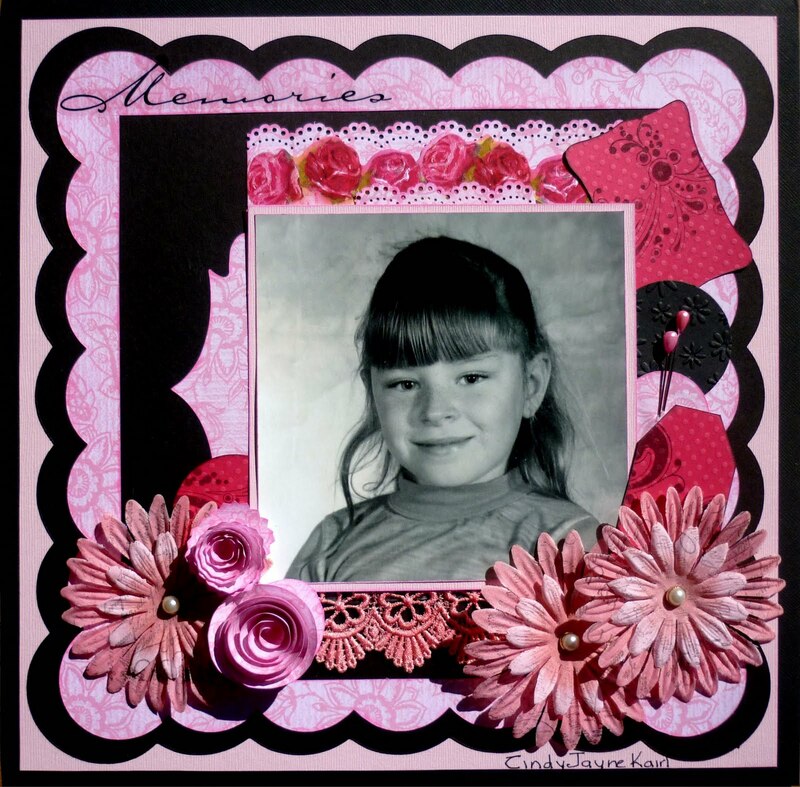 I have glimmer misted the background and then stamped a flower image with Versamak clear ink all over it. It is very hard to see the stamping but it is there. I then used the sewing machine to stitch around the edge and to sew the photo onto the double photo mat. I cut strips of various patterned paper and then punched one edge of each strip with an assortment of border punched. I stuck these strips to a piece of white card and then cut the scalloped half circle out of it. I cut a strip of cream patterned paper and punched the edge before pleating and stitching through the middle. The tags are made of hand-made paper and I have sprayed with glimmermist and stamped on them as well. I then hand made the flowers and sprayed the leaves with glimmermist. I'm going to start a new layout this afternoon I hope so will post it when it is finished. Look forward to reading any comment you might like to leave for me. Wednesday night and Ray is at work at the Bakery, his LAST shift. I am pretty happy about that and am looking forward to being able to do lots of things on a Sunday. Not having to rush back in time for him to go to work if we go away on a Rock n Roll weekend is one of them. 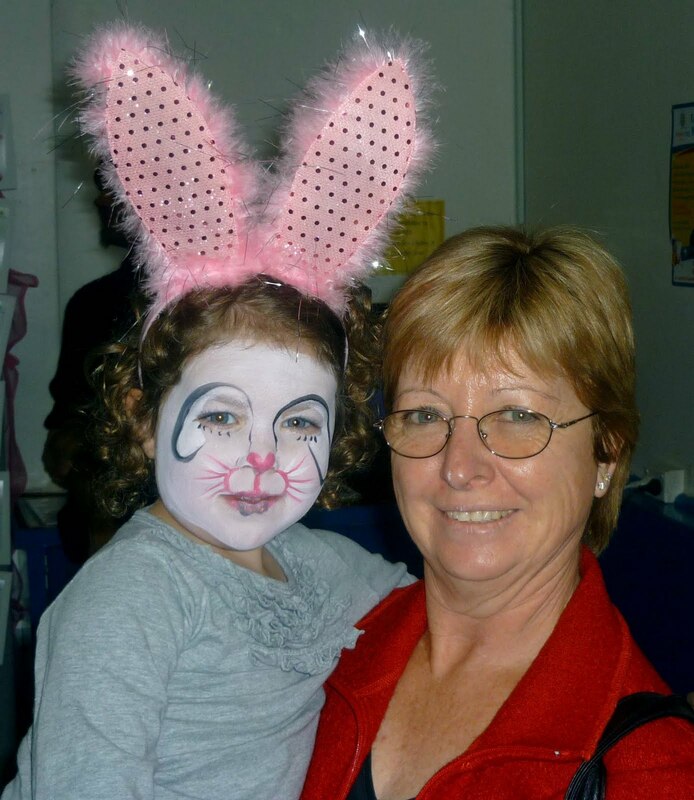 We went to the Anzano Club last night to see the Party Cats and had a good night. Unfortunately it was the last time that event will be happening. There was not enough support to make it viable for either the band or the venue. Yesterday we had Charli for the day as usual but as it is school holidays "Beeboppers" was not on so we took her to a craft session at the shopping centre at Glenelg and she made a snowman on a canvas. She loved doing it. My scrap room is a mess because I have not had a chance to clean it up today after finishing the last layout. I have spent the day grocery shopping, bathing and trimming Daisy, paperwork and walking. I have started walking for 30 minutes everyday on my treadmill. It was a requirement when I had my varicose veins treated and I thought that if I could do it for those 2 weeks I can do it on a permanent basis. I read a novel on my ebook while I am walking and the time just flies. I have also started a food diary and am keeping a close eye on what I eat. I have put on a few kilos over the last 4 - 6 weeks and I want to get rid of them and a few more. Ray & I are going on a 3 day Elvis Cruise in Nov (Ray is DJ'ing on the cruise) so I want to loose about 7 or 8 kilos by then. I have also stopped drinking Diet Coke!!! I had a very bad addiction to it and would drink nothing else (no water at all). When I stopped I had a very bad headache for 4 - 5 days but that is gone now and I have an occasional Diet Coke when we go out, I do not keep any in the fridge at home so I am not tempted to drink it. WOW what has got into me???? This is the layout I did for the Once Upon a Sketch Challenge for 1st July. I know I have left it to the last minute but I am happy that I made the deadline. 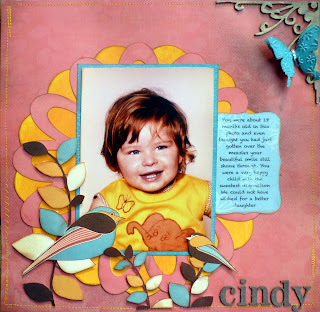 I have used the Kaisercraft Peachy Keen Collection of papers and some bright yellow bazzil. I sprayed some Black Magic Glimmermist in two area of the background then stitched around the edges with some yellow thread. 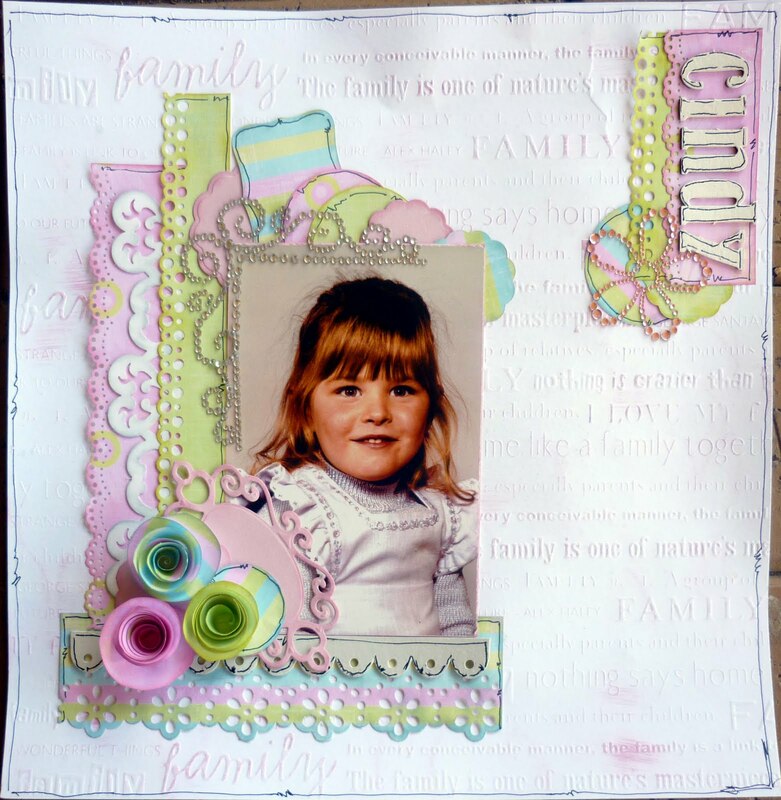 Using the Paper Lace Cartridge and Cricut I cut the photo background out of the bright yellow bazzil and some of the orange paper. I then sprayed the bazzil with Starfish Glimmermist to tone it down. I fussy cut the birds and leaves and mounted them with foam tape. All of the chipboard has been painted with Black Magic Glimmermist. 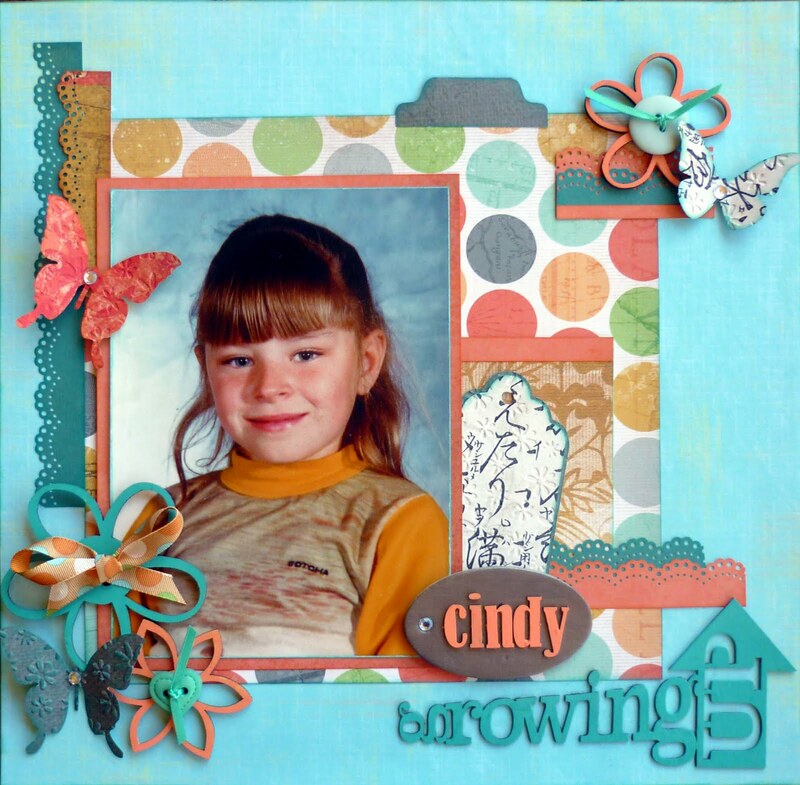 The journaling was printed on velum with a flower print on it, mounted on some teal paper and cut out with the Big-Shot. 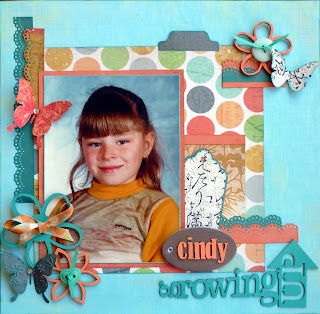 The two butterflies were cut out with the Big-Shot and then embossed. All edges have been inked with Chestnut Roan. Just a quick post to show you what I made this afternoon. I had to go to the sewing centre to get a new globe for my machine and while I was there I saw their lace stand. 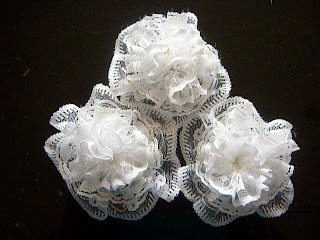 I bought 2 different laces and have combined them to make these 3 tier lace flowers. One of the laces was about 50mm (2 inches) wide and when I tried making a flower with it at full width the edges pulled under so I cut it at about 1 1/4, gathered them up and layered one on top of the other. 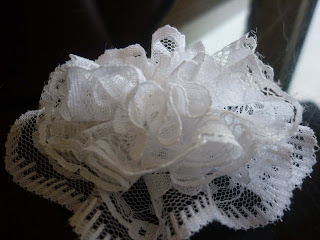 I also bought some lace that was about 1" wide and layered that lace between the 2 others. I will use a large gem or similar for the centres but have not put them on yet as it depends what layout I put them on what colour the centres will be. Another good thing about them being white is of course I can spray them with Glimmermist to suit the colour of any layout I wish to use them on. Heading off to Legends Rock n Roll Club tonight so hopefully will get a bit of dancing in although Ray is still not completely better. Ray has got a cold so I have been busy today. Did some housework, cooked scrambled eggs for lunch and did the grocery shopping this afternoon. We were going to go to the Adelaide Rock n Roll Club on Tuesday night but that was the first day that Ray was feeling sick so we decided to stay home and keep warm. I took Charli to Bee-boppers on Tuesday instead of Ray. She has her concert on Saturday so hopefully will get some photos. They are doing the Alphabet Rap and the Bee Song. 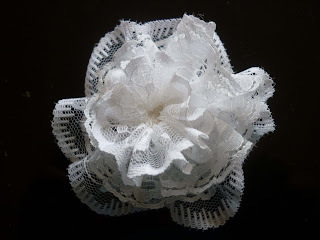 I have made a list of the various challenges that I have come across in the net through blog hopping and have decided to give a few of them a go. Will post them as I finish them. 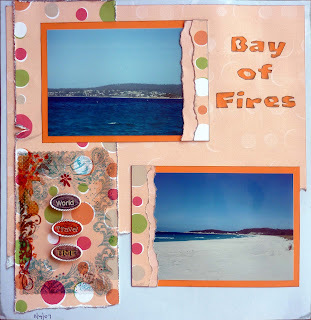 These two layouts show Bay of Fires. Beautiful white sand and blue sea. There are many beaches like this in Australia and they all bring an appreciation of their beauty, no matter how many times you see it. Bay of Fires is on the east coast of Tasmanian and well worth calling in to have a look at. I bought a bookazine (that is their word for it, it is a 250 page magazine) at the newsagent called Photoshop Creative Collection, it is dedicated to teaching people how to use Photoshop to do lots of different things. I thought I would work through it and learn lots of new tricks and tips hopefully. Now all I have to do is spent the time doing it. 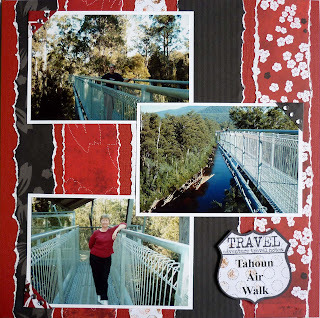 Oh well off to do something.....scrapbooking or Photoshop ??????? what a choice. It has been quite cold here and I have not felt like doing much at all. The compression stockings are annoying me and I will be glad to get them off. Luckily I do not have to wear them while sleeping so there is some relief. Only 3 days to go. Yaaayyyy. Anyway enough of the grizzling. Friday night we went to Legends Rock n Roll Club. The band was the Kreole Band and they played a lot of Elvis song. We did not do much dancing but we did catch up with some of our friends who we had not seen for a while. Saturday morning we went to Charli's Fairy Ballet concert. 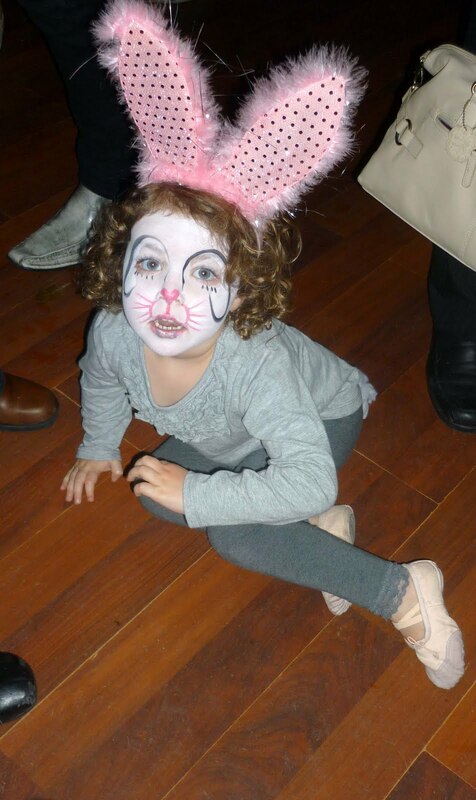 She was Peta in Peta and the Rabbits and she was very cute. These photos was taken before the performance. She did very well with her performance and stuck mostly to the script. Saturday night neither Ray nor I felt like going out so we had a nice night at home and a reasonably early night. Today has been a lazy one as well. I think I am going to do the ironing and watch TV tonight while Ray is at work. 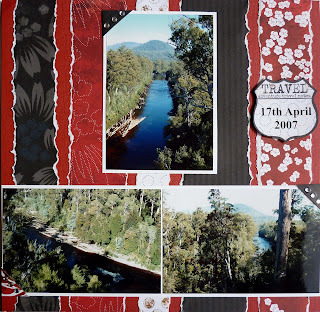 The two layouts below are from my Tasmanian album and are of a place called The Wall in the Wilderness. If you go to Tasmania DO NOT MISS IT. 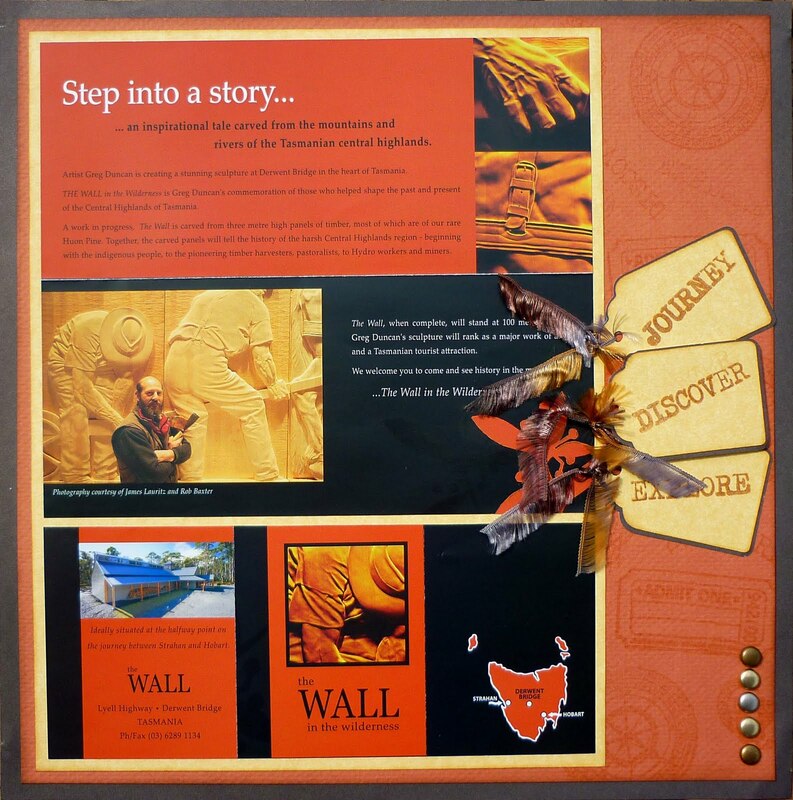 It is a hand carved scene in a wall of wood that will be 100 meters long depicting a scene from the early days in Tasmania. It is being created by Greg Duncan. It is on the Lyell Highway near Derwent Bridge. I would have loved to have bought a piece of his work but it was out of my price range.